Mercedes-Benz has revealed the fourth of up to eight new compact models at the Paris motor show with the debut of its third-generation B-Class. 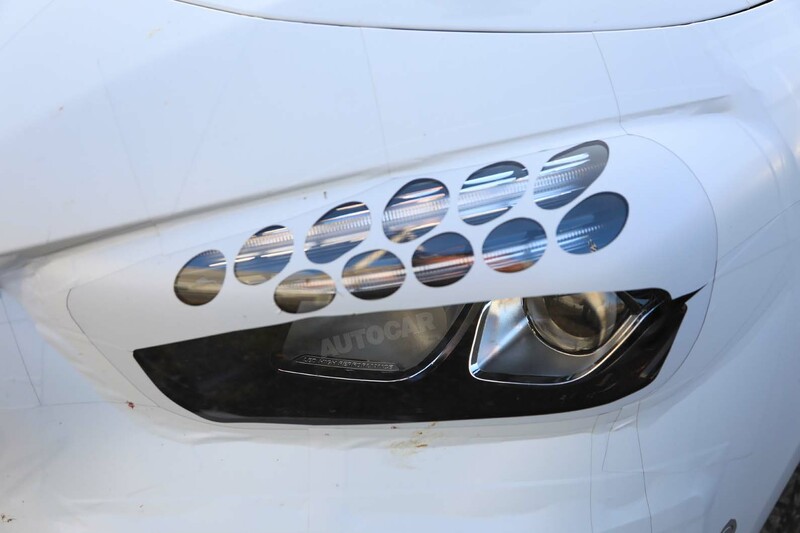 A new preview video was released on social media before the debut and shows glimpses of the new car's design, which draws heavily from the new A-Class and follows the brand's new family face. The interior has also been overhauled, with Mercedes' new MBUX infotainment system stretching a single screen from the instrument panel to the centre of the dash. 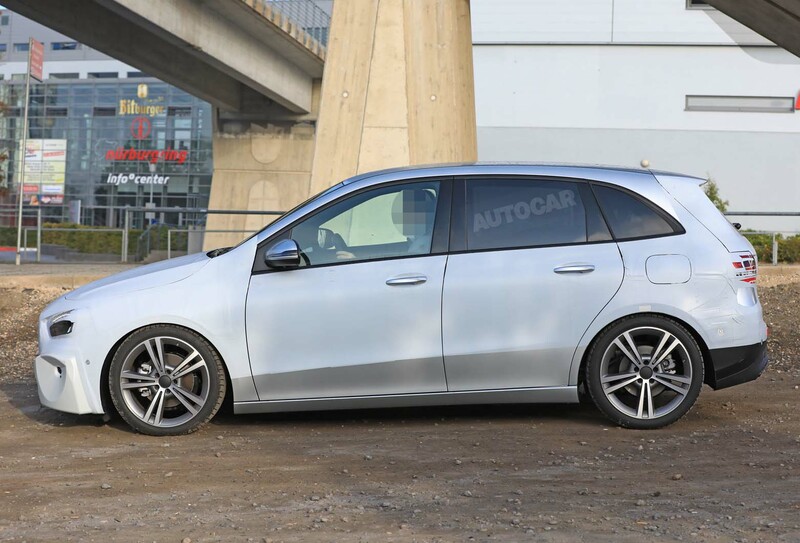 Also shown here undergoing a final round of tests ahead of a planned start to UK sales in early 2019, the five-seat MPV will join the recently introduced fourth-generation A-Class hatchback as well as standard and long-wheelbase versions of the new A-Class Saloon. These are part of an expanded line-up that will also include second-generation versions of the CLA, CLA Shooting Brake and GLA, as well as the new GLB, in showrooms by the end of next year. The new B-Class, known under the internal codename W247, retains the one-box silhouette of its predecessors, but in a much smoother form that reflects Mercedes' latest design lineage. The heavy structuring and taut surfacing evident in the sides of today’s second-generation model gives way to a simpler and largely unadorned treatment. The BMW 2 Series Active Tourer rival also adopts the so-called 'predator face' of the A-Class, giving it greater visual impact at the front. At the rear, its tailgate is more sharply angled than before. 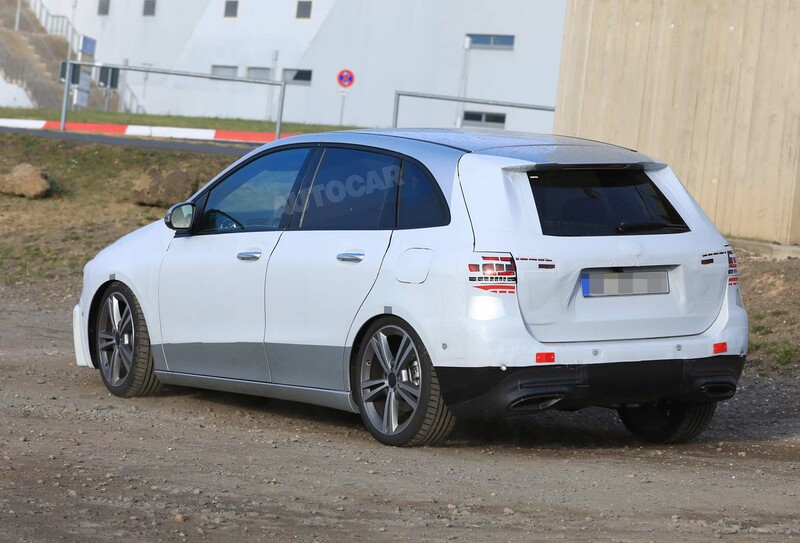 The prototype pictured here indicates the new MPV will offer similar practicality to the old B-Class, with similarly sized door apertures and a low loading lip at the rear. As with all of Mercedes' latest compact models, the new B-Class is based around a heavily re-engineered version of the MFA (Modular Front Architecture) platform. It has been extensively reworked to provide greater levels of rigidity than the existing structure, in a move a source at the German brand's R&D centre suggested will provide the car with “vastly improved ride and refinement”. Mercedes' initial plan was to produce the new B-Class in both standard and long-wheelbase guises as a means of matching the versatility offered by the five-seat 2 Series Active Tourer and its larger, seven-seat 2 Series Gran Tourer sibling, but the decision to push ahead with the GLB means the new MPV will instead follow the example of its predecessor. Mercedes buyers seeking seven-seat compatibility in the compact class will be catered to by the new GLB, according to Autocar’s source, who says it has a longer wheelbase than the B-Class. The new SUV, conceived to compete directly against the Audi Q3 and BMW X1, is planned to be sold in both five and seven-seat forms. However, the new B-Class has grown, albeit incrementally, with minimal increases over its predecessor, which is 4359mm long, 1786mm wide and 1557mm tall. Inside, the new MPV adopts the new digital cockpit and connectivity functions of the A-Class, including a high-definition instrument and infotainment panel and Mercedes' new MBUX operating system, which supports conversational voice commands. Improvements in packaging are said to have liberated added accommodation, while the adoption of a newly developed torsion beam rear suspension is said to have led to an increase in boot space beyond the 488 litres of the outgoing model. The front-wheel-drive model is set to go on sale with a limited number of transversely mounted four-cylinder petrol and diesel engines, although other options, including for the first time a new plug-in hybrid powertrain, will be introduced in the longer term. On the petrol side, buyers should expect a B200 running a 161bhp 1.3-litre engine and a B250 with a 222bhp 2.0-litre unit. The sole diesel at launch will be the B180d, which runs a 116bhp 1.5-litre engine. Other models will follow throughout 2019, including an entry-level B160 and B220 petrol models, as well as B200d and B220d diesels. Gearbox choices include a standard six-speed manual, with buyers set to be offered the choice of optional six-speed and nine-speed automatic dual-clutch units depending on the engine. Both the B220 and B250 will also be sold with the choice of 4Matic four-wheel drive. To counter sales of the BMW 225xe, Mercedes also plans to offer the new B-Class with a new plug-in hybrid system that is set to provide it with an electric-only range of up to 31 miles. To be employed in a new B250e 4Matic model, it uses the 161bhp 1.3-litre four-cylinder engine from the B200 to power the front wheels in combination with a 90bhp electric motor driving the rear wheels. It's a declining market and a car which looks like this does nothing for the brand's image, does it? Either drop it or do a hot version, 220bhp isn’t enough! The B class is a small selling model with no sporting pretensions. Demand (i.e. real demand from people willing to spend real money rather than internet experts) for an AMG version would be negligee and would sell in single digits and likely never recoup the development costs. An odd decision to carry on. An odd decision to carry on. Europen sales figures show nearly half as many being sold compared to 5 years ago. MB must see merit in continuing with this model, if only as a platform to launch the GLB? ...it must have taken the design department trainee no more than 20 minutes to knock this out, so no big effort required. for carrying on with the B class, if there is a business case for it. More choice for those who want a family car that isn't pretending to be an off roader. You're kidding, it's another facelift just like the "all new" A-class!!!!! Mercedes tells us it's all new & we beleive 'em!!! !